Ajwain paratha is a simple Indian flatbread served with curry, dal or simply pair up with curd or pickle. Even you can have them with tea which makes a perfect combo altogether. Apart from ajwain paratha, you can make ajwain poori and ajwain roti with the same dough. They are great for breakfast or dinner and lunch. Carom seeds or ajwain seeds are rich in fiber, minerals, vitamins, and antioxidants. They can be consumed raw, like chewing raw seeds, boil in water or add in tea helps in maintaining the digestive system. 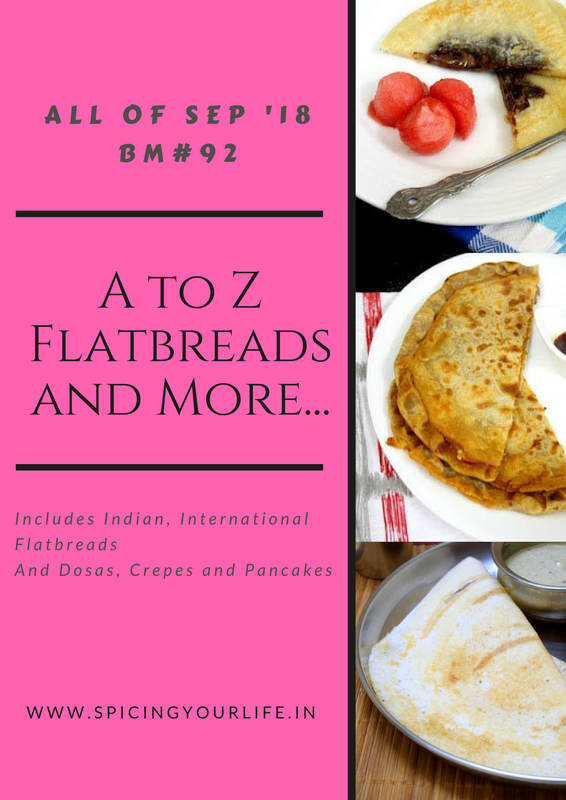 This September month I am participating in a month-long blogging marathon of A-Z Indian Flatbreads hosted by Srivalli with many bloggers. Feeling pretty excited as it is my first time of everyday blogging. Moreover, we all are happy at home as I am going to cook new flatbreads every day. In this A-Z series, I chose A-Ajwain Paratha which is commonly made in every Indian kitchen. After a long time, I cooked it from scratch. Generally, I make these with leftover dough. This paratha goes very well with any dal or gravy. Enjoy ajwain paratha with Gajar Matar Sabji, Lauki Chana Dal, Rasedar aloo gobhi or Achari bhindi. You can also serve with lentils like Panchmel dal, Urad dal tadka or Dal palak to name a few. Ajwain added in simple whole wheat flour along with ghee (clarified butter) and salt, all it takes to make these easy ajwain parathas. Adding carom seeds makes a prominent taste to parathas. So let see how to make this Indian flatbread Ajwain Paratha. Take a mixing bowl and combine flour, ghee, salt and ajwain seed. Make a soft dough using warm water. Add a little water after using a half cup. Keep it aside for 10 minutes. Heat a griddle on medium flame. Divide the dough into equal parts. I could make 5 parathas with this quantity. Now roll this triangle into 6″ paratha and place it on the heated griddle. Cook on both side by applying oil or ghee. Cook until golden brown. Serve hot ajwain paratha with any of your favorite company like curd, pickle, tea or potato sabji and enjoy. Use oil if not comfortable using ghee. This paratha is very simple and easy. Normally in ajwain paratha, we don’t add any other ingredient as ajwain itself has a strong taste. Normally in ajwain paratha, we don't add any other ingredient as ajwain itself has a strong taste. Ajwain paratha is very simple and common paratha which is 1st choice of every kitchen to serve as breakfast.. awesome plating. Mom always rolls out triangle parathas! And adding ajwain makes it all the more yum! The whole platter looks inviting! Those ajwain parathas are looking so inviting and nicely done!..I frequently add ajwain to our chapatis and is so healthy!..looking forward to your dishes letters! Welcome to the Mega Marathon Bhawana. I’m sure you’ll love it and then wouldn’t be able to resist joining the others. I love ajwainor jeera flavored parathas and make it a point to include either in the dough every time I make parathas. Would love to have your paratha with some tea right now. Such healthy and delicious looking paratha’s this are. Light on the tummy too. We make this quite often specially when we do not have any vegetable along side. Ajwain is a great aromatic spice and we use them in deep fried recipes. Adding ajwain in parathas is a nice idea. The whole platter looks awesome. Ajwain Parathas are one of the best ones to be served for breakfast , ah a little ghee and they reach another level . Very well made Parathas and a great pick for the alphabet . Am a crazy fan of triangle parathas since my childhood, i dunno still y and how,. Lovely ajwain parathas, just love adding ajwain seeds in most of my parathas, just prefect to finish my dinner with all those fingerlicking side dishes. Lovely start Bhawana, keep rocking gal. Look at those perfectly layered Ajwain Paratha. I love the flavor of ajwain and I am tempted to have that platter for breakfast. Lovely start to the marathon and can’t wait to see the rest of your flatbreads.